Peter Brooks-Tee (who, long standing Members may recall, raced a Vincent-powered three-wheeler named Gran Vin in the 1980s) standing in Alan Wright’s workshop, next to Alan’s 1947 Rapide. Photo courtesy: Alan Wright . The President is a senior Member of the Club whose experience, advice and influence is of benefit to the Club. The Chairman shall have an overview of all club affairs and will see that these are conducted within the rules and policies of the Club. The Secretary is responsible for arranging and recording all meetings of the Club and its main Committees. Hon. Treasurer The Treasurer is responsible for the implementation of all financial business of the Club, from collecting subscriptions to paying bills. 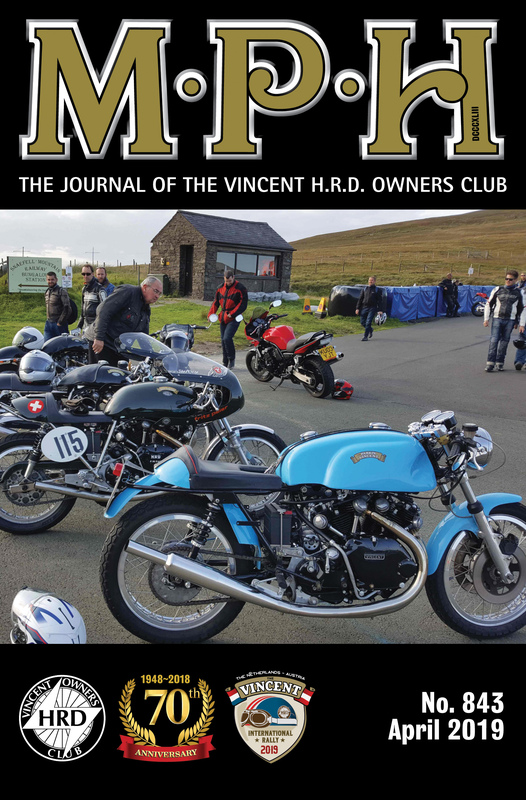 Under the Rules, the Club will publish a monthly journal, MPH, to all Members. The Editor is responsible for compiling, publishing and distributing MPH but may seek assistance in this task, from volunteers or commercially. The Social Secretary is responsible for organising and co-ordinating the social activity of the Club. The Liaison Officer was first appointed in August 2002 using the vacant EC position of Sports Secretary. With a rule change in October 2002 the Sports Secretary post was changed to Liaison Officer along with appropriate portfolio. The Information Officer is responsible for the Club’s Public Relations, the flow of information into and out of the Club as well as within it. The Overseas Representative is responsible for ensuring that the large body of members living outside the UK are represented in the committees that run the Club and decide on Club Policy, and that such members are kept informed of developments within the Club. The Technical Officer is responsible for the Club’s involvement in the technical and engineering aspects of ownership of machinery produced by the Vincent Factory. He is responsible for co-ordinating the work of the Club’s Technical Committee.